CoolStream Duo connects Bluetooth turntable and Bose SoundDock. Yes, the CoolStream Duo will pair to a Bluetooth enabled turntable. The AT-LP60BT from Audio-Technica is the latest technology in Bluetooth devices. 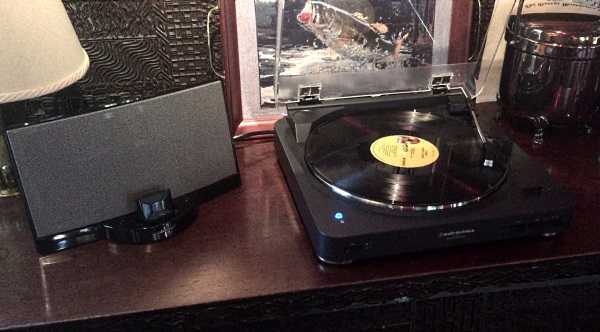 This new take on an old standard, the record player, is outfitted with Bluetooth capabilities. How does it work with the Duo? Place the Duo on your docking station, we have a Bose SoundDock shown here, then pair your Duo to your turntable. Now you can choose your favorite record and let the music play through your Bose speaker. So now, not only can you keep using your beloved Bose SoundDock (or other compatible docking station) but you can listen to that record collection that you have accumulated over the years through your favorite speaker.